Vic Doolan showed off theFisker Karma at the Detroit auto show this month. 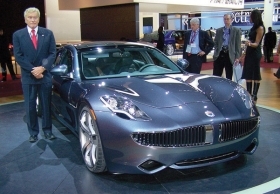 Fisker's first car, the 2010 Karma, is a sedan with sticker prices ranging from $87,500 to $106,000. Sales begin next year. The company touts itself as environmentally friendly and urges dealers to adopt policies that conserve resources, such as using an existing building for a showroom rather than building a new structure. The Karma was designed by Fisker Automotive CEO Henrik Fisker, who was responsible for such designs as the BMW Z8 and the Aston Martin DB9 and V8 Vantage. The plug-in hybrid technology with a lithium ion battery pack was developed by Quantum Technologies.